2Wire gateway or Internet router with modem, whether it’s 2Wire HomePortal or co-branded, keeps track of all devices or computers that accessed and are connected to it, via wireless connection or wired (Ethernet) connection. The devices include all laptop, notebook, netbook, nettop, Sony PS3, Microsoft Xbox 360, Nintendo Wii, network attached storage, print server and any other devices connected to the network provided by the 2Wire gateway. Thus, the device list in the 2Wire gateway can grow over time as devices connect and disconnect. 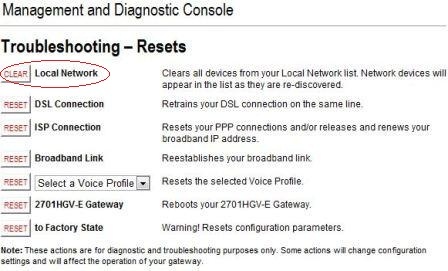 2Wire gateway’s Device List under Local Network can naturally drops and removes inactive and disconnected devices that have not connected again for a long time from view, but in firewall settings page, all computers are still been listed, although some may already not in used. It’s possible to to delete and clear the device list completely, or hide the inactive device from the Device List display. But for 2Wire firewall, user must clear the local network to delete and remove all devices from history to get rid of list of computers in its list. Open 2Wire HomePortal gateway system web page at http://gateway.2wire.net/. Go to Home Network tab. Under “Display Settings”, untick and uncheck the check box for Show inactive devices in network list option. Note: The option above can also accessed via 2Wire HomePortal Management and Diagnostic Console (http://gateway.2wire.net/management or http://gateway.2wire.net/mdc), at Configure under “Local Network”. Open 2Wire HomePortal Management and Diagnostic Console at either http://gateway.2wire.net/management or http://gateway.2wire.net/mdc. Go to “Troubleshooting” section, and click on Resets. Click on CLEAR button for Local Network to clear all devices from Local Network list. Network devices will appear in the list as they are re-discovered. Tip: After clearing the device list, the current or activate computers and devices may either don’t show up in the Device List or been assigned with the name that starts with unknown….. The problem will go away and revolved when the device renew the IP addresses automatically.